Nothing like a steaming bowl of fall veggies and lentils to warm your soul. Do you love lentils? If so, you and I have a lot in common. 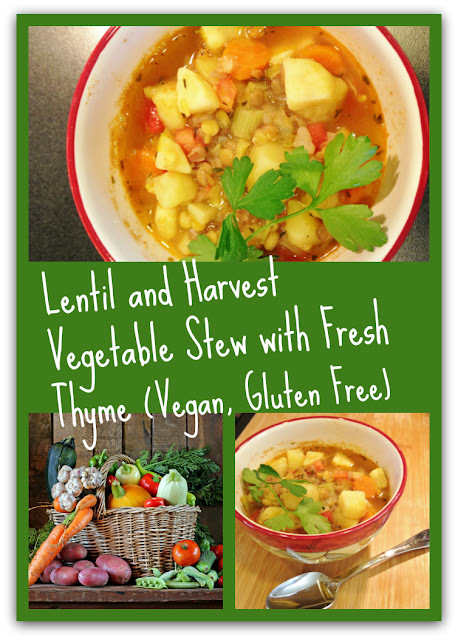 This nourishing, comfort-food vegetable and lentil stew is one of my favorite meals when the leaves start changing colors and temperatures drop. The chunky vegetables and vibrant herbs will fill your house with the most wonderful aromas as you simmer it on the stove, and you'll feel you are taking extra-special good care of yourself by indulging in as many bowls of it as you like. I promise. Sauté the onion and garlic in olive oil over medium heat for a couple of minutes, then add the celery and cook until onion is translucent. Toss in the marjoram and cook until fragrant, 30 seconds to one minute. Add the carrots, potatoes, sweet potato or yam, and sauté a few more minutes to blend the flavors. Pour in the broth or water plus bouillon and add the lentils. Bring to a boil, toss in the thyme, and simmer for about 30 minutes, or until the lentils and vegetables are done. Add the tomatoes, salt, and pepper and simmer another 5 - 8 minutes. (Don't put the tomatoes in until the potatoes are soft, because the acidity can keep the potatoes from cooking thoroughly.) I like to simmer this down until everything is creamy, buttery-soft, about 35-40 minutes total. Enjoy by itself or with a hunk of grainy wheat bread or gluten-free bread. Yum.